Are you building a new home and you'd like a lawn installed? Are you renovating an existing lawn that is in rough shape? Are you landscaping a commercial property and need lawns installed? Are you building a residential development and you need new lawns quickly? 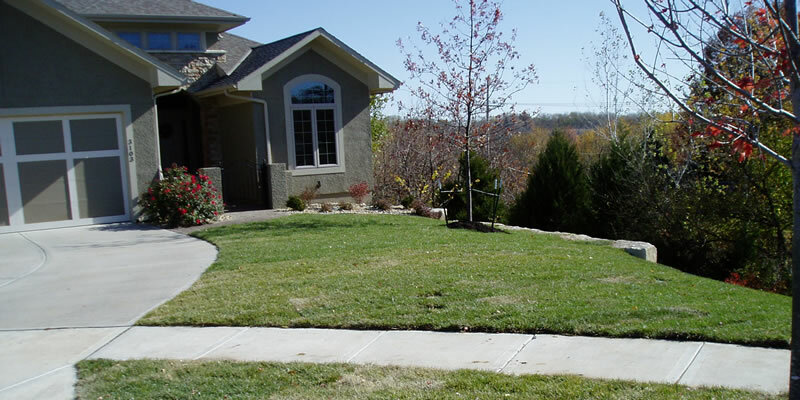 Green Acres Lawn & Landscape is a licensed and insured landscaping contractor serving the Kansas City Metro area. We specialize in installing new lawns for our residential and commercial clients using both grass seed or installing new sod. From grading and preparing your lawn area with proper loam soil, installing proper lawn drainage, organizing irrigation or sprinkler installations, and spreading the grass seed or rolling out sod we can provide you with a beautiful looking new lawn. Grading your lawn area is an important step when installing your new lawn and if it's not done you're going to end up with an unnattractive lawn with dips, valleys, and low spots that will collect and pool up with water when it rains. 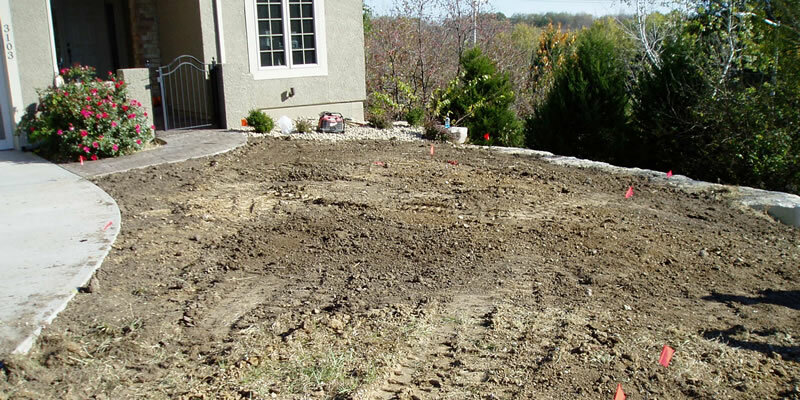 A lawn should be graded with a slight slope away from your home or any other structure. In some cases drainage should also be installed or any existing slopes utilized to ensure water flows away from the lawn areas. Should You Use Sod Or Seed For Your New Lawn? There are pros and cons to each method and it really boils down to your budget and how soon you'd like your new lawn to be ready. Installing a new lawn with grass seed often requires a little more surface preparation as seed is not as forgiving as sod. If you're using seed it's going to need to be regularly watered which can be a problem if you don't have an existing irrigation sprinkler system installed. Using grass seed can also take several weeks until you have a nice looking lawn. This can be a problem if you have children and pets who love to enjoy your property. Installing a new lawn with sod is literally like rolling out your new grass. It requires slightly less surface preparation than grass seed but sod is also more expensive as you're buying grass that someone has spent the time to grow. Sod is weed and pest free so when it's rolled out on your lawn area you'll have instant grass. The lines between rolls will usually disappear with a week or two and you're left with a beautiful, lush, green lawn. If you have a timeline to meet then sod is really the best way to go. Whether you're installing the new lawn using grass seed or sod it's a good idea to consider having an irrigation or sprinkler system installed at the same time. The cost for your irrigation system will be lower than installing irrigation on an already growing lawn. Many homeowners have good intentions and want to just water the lawn on their own using a sprinkler and a hose. We've replaced dozens and dozens of those lawns because no matter how good the intentions are the lawn almost always is neglected or waterings are missed and the investment slips away as the grass begins to die and turn brown. Having a proper irrigation system installed that can time your watering schedule and deliver the right amount of water where needed is good insurance for a healthy lawn and it can actually save you water over trying to do it by hand. If you’d like to schedule a consultation with us to discuss installing your new lawn using sod or seed we’d be happy to meet with you. Please call (913) 422-5111 or fill out our online form and we’ll get right back to you.